Donations to the Wildflower Society of WA – a not for profit incorporated association – will be used to further the conservation and preservation of WA flora, to raise awareness of bushland issues, promote the cultivation and study of WA flora, and to support the activities of the Society throughout WA. These donations are not tax deductible. Donations to the Bushland Conservation Fund – a tax exempt fund – will only be used to support the environmental purposes of the Wildflower Society. These donations are tax deductible. Payment by direct credit – Appropriate for large donations. Please ensure that your donation details includes your last name. How do you want to make your donation? - You may make your contribution by credit card - or - by direct credit to our bank account. - Credit cards have the usual fees deducted, and are the easiest way to make a donation. You will receive an email receipt immediately. - Direct credit payments need to be made via your financial institution, but there are no fees, making direct credit more suitable for large donations. You must include your name in the transfer details. You will receive a receipt by email once the transfer has been made and processed to our account, usually in a week. Every branch of the Wildflower Society sponsors walks and other excursions. 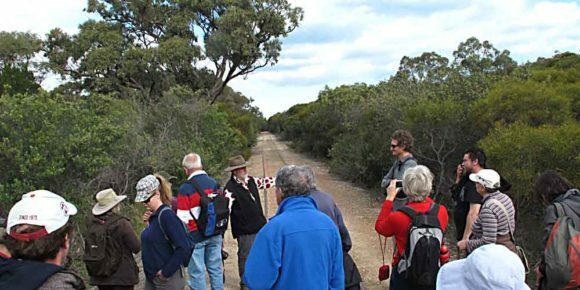 Check the Society events calendar for walks and talks throughout Western Australia. Events.